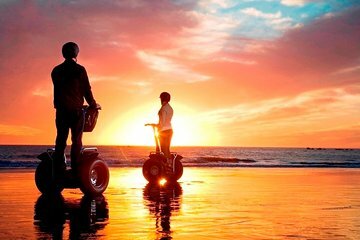 Vea la puesta de sol sobre una playa de Oahu en un recorrido en Segway de 1,5 horas por el pintoresco puerto, las playas y los parques de Honolulu. Aprenda a dirigir su Segway, siga a su guía por las calles tranquilas y disfrute de las impresionantes vistas de Diamond Head y Waikiki. Cruce el Ala Wai Yacht Harbour hasta un canal costero, luego observe a los surfistas cabalgando mientras exploran Ala Moana Beach Park. Deslízate entre los árboles de higuera y las palmeras de coco mientras las estrellas aparecen sobre el océano y experimenta una perfecta puesta de sol en Hawai. We had Danny...so knowledgeable and super friendly. took us up diamond head...giving us amply opportunities to take photos and soak up the view. the pre tour instructions were easy to follow. HIGHLY recommend this tour. we saw so much more than if we were on a bus or even walking. Do it!!! We met with Michael at the Segway of Hawaii shop for our sunset tour. We were lucky that my wife and I were the only ones on this particular tour. Being experienced segway riders 5th time, we were tested and on our way in no time. Let me say, we've ridden segways in fun and exciting places Old San Juan, Chicago by the Lake, NOLA, Nassau, but no ride has been as beautiful as the ride up towards Diamond Head! Michael was a fantastic tour guide. He gave us receivers so we could hear his narration. He knows so much about the island and the locals. We love eating local foods and he gave us several great recommendations, our favorite being the Cafe Kaila no too far from Waikiki. The trip lasted over 2 hours and we stopped several times for some great photos. The grand finale was the perfect timing on the beach for the sunset photos. There were no Cons to this trip, only Pros: newer segway units, great riding locations, interesting narration and sites including the MTV Real World house among others. Ask Michael nicely and he'll tell you the best places for snorkeling and spear fishing away from the crowds! Also ask him about his time with an Iron Chef!! For those who have never ridden a segway and are wondering if you can do it, let me tell you, you can! My wife and I are both almost 60 and we love it. We try to do it on every cruise we are on. As long as you are within the weight limits check with the place you are using, each one has different requirements based on the their segway model and can stand upright for a couple hours, with breaks, you'll do fine. You don't have to have great balance, because the segway does that for you. I encourage everyone, at least try it once. Segway of Hawaii has other great tours besides ours. There's no question we'd ride again with them. Their shop is easy to get to and you start riding just outside. We thoroughly enjoyed our Sunset Beach Segway Tour. We were put with another 4 tourist who were not picking up the segways as well as we did so they split us up and took us on our own so we could get the most of our tour. Great service, great equipment and definitely worth doing. Would do it again without a doubt. What a buzz. Felt like a mini - celebrity zooming by all the people on Waikiki Beach. People asking where we got the Segways and how they can do it too. What fun! Our guide was Ryan he was great! We had never been on a segway before. It was a ton of fun. Ryan was full of information! We loved the tour!! !